Planet Full Of Blues, Olivia’s in the Village, and Xtra 99.1 FM Join Forces for "Juke Joint Saturday Night"
The Gloucester, Virginia band Planet Full Of Blues, Olivia’s in the Village, and radio station Xtra 99.1 FM will bring the old time juke joint back to life for one evening on Saturday, July 20, 2013 from 9:00 PM -12:00 AM. 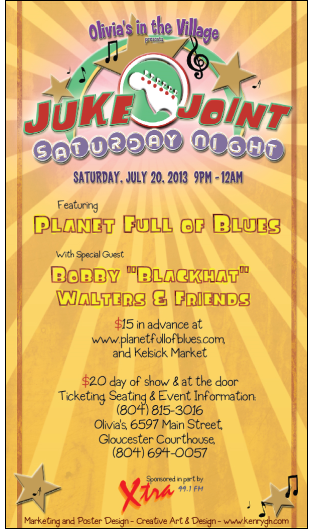 "Juke Joint Saturday Night" will feature Planet Full Of Blues and Bobby "Blackhat" Walters and Friends for a night of live blues, dancing, and a special menu by Olivia’s. Xtra 99.1 FM’s Neal Steele will host a live interview and on-air performance by Planet Full Of Blues on the morning of Friday, July 19. Planet Full Of Blues will perform a mix of original blues rock songs along with special selections from a variety of other national blues artists. 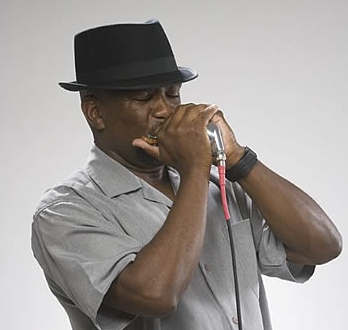 Also performing will be Bobby "BlackHat" Walters, a well-known area blues harmonica player, vocalist, and songwriter, accompanied by Herbie D and Chris Grooves of Herbie D and the Dangermen. Johnny Ray Light of Planet Full Of Blues said, "When our band performed in Serbia a few years ago, our hosts took us on a long, crazy bus ride through Belgrade to the Vox Club, a well-known juke joint supported by several famous blues artists. You had to push a buzzer on the fence to get in. Once you got inside you couldn’t move. 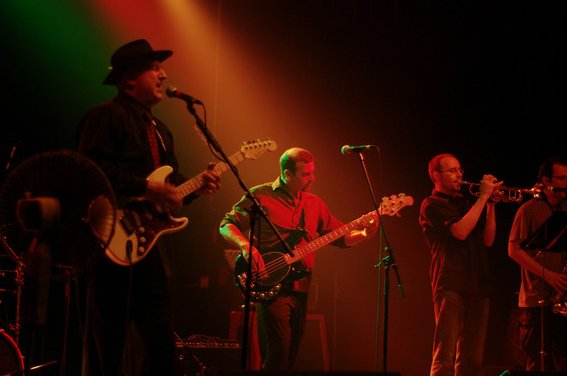 The place was tiny and crammed to the walls with locals there to see "Rawhide," a popular Belgrade blues band. Yes, "Rawhide" – in Serbia! It was a real thrill when we were asked to get up and play a few tunes in a real deal no-nonsense juke joint. Since then, we have wanted a chance to re-create that kind of experience here; even for just one night. The blue moon was shining on us when circumstances put us in touch with Gary Ward of Olivia’s. Gary immediately threw open the doors and said, "Let’s do it!" Now’s the chance for all our friends to put on their dancing shoes, enjoy some rockin’ blues, and experience the old time juke joint vibe for just one night." Advance tickets are $15 online at www.planetfullofblues.com , at Kelsick Market on Main Street in Gloucester, and $20 on the day of the show and at the door. Guests with advance purchase tickets will be eligible for 10% off an entrée at Olivia’s during the show and receive priority for reserved seating. Walk-ins are welcome with seating based on availability. 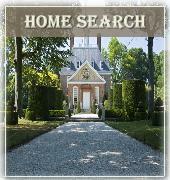 Call (804) 815-3016 for information about the show and to confirm seating. Olivia’s will be open for regular dining customers on the night of the show.